In a private villa compound, just off Nai Harn beach, Villa Aruhe is a quaint little villa with two bedrooms, offering you quality services and accommodation in beautiful Phuket. The villa ensures that you get the privacy and exclusivity inherent to these properties, and that you can spend some quality time with your loved ones. There is much to see around the villa, and you get to explore the nearby beaches, which are only a few kilometres away! There are two bedrooms in Villa Aruhe, one of them being a master suite and another guest bedroom. This dainty villa is ideal for couples or smaller families, where you can enjoy peacefully without any disturbances. The master suite is furnished with a king-sized bed and directly opens out to the swimming pool. Thus, it offers you an excellent vista each morning when you wake up on your comfy super-sized bed. The en-suite bathroom is fitted with a soaking bathtub and a shower for your convenience. The guest bedroom is also furnished with a king-sized bed and has an en-suite bathroom fitted with excellent amenities. Each room boasts a comfortable and warm atmosphere perfect for holidaying! As you enter the villa compound, you will be greeted by abundant tropical foliage bordering the property, and affording it a natural and untainted quality. Amidst green grass and dense nature, resides a lavish swimming pool. Glistening under the sun and reflecting the clear blue skies. The pool is fed by a water feature at one end, which adds a serene and meditative quality to the area. You can even rest on the outdoor sitting area provided for the guests, which is situated right beside the pool and garden. There is ample greenery besides the pool as well, as there is a tropical garden for you to walk on or meditate on! The living area is directly accessible from the swimming pool through glass doors. As you enter, the centrally air-conditioned room will engulf you in its inviting ambience and you will feel relaxed and right at home. The area is well-furnished with a comfortable and cosy sitting area, containing plush couches placed around a coffee table. The open doors that lead to the pool add a bit of natural lighting in the room, making it welcoming and refreshing. 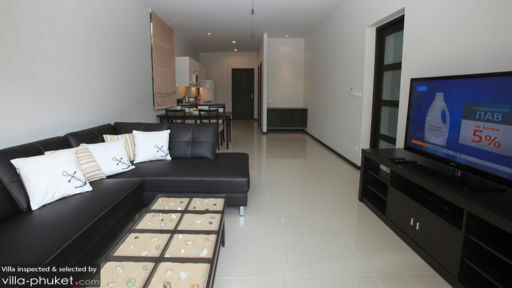 You can watch TV while you relax on the sofas and enjoy some blissful quiet in Phuket! A dining area and kitchen is also provided for the guests’ convenience which is a part of the large and spacious living area. The dining table can seat 4 people comfortably and the kitchen is fully-equipped and modern with the best amenities already fitted for your use! The staff and services rendered at Villa Aruhe are exceptional as they cater to the guests’ demands for anything they wish or desire. Guests can seek assistance for almost everything as the staff will ensure that your stay is comfortable and memorable. As the villa is located in a private compound, you are afforded a sense of privacy and luxury however, the villa is quite close to the other beaches around Phuket. These include Nai Harn beach and Rawai beach. There are multi-cuisine restaurants all around the villa for you to choose from!